America’s small towns are fighting back against climate change denial and lack of leadership at the federal, and in many cases, state levels by taking matters into their own hands and moving forward to build greater climate resilience. The Mississippi River Cities and Towns Initiative, an association of mayors along the river, has developed a Climate/Disaster Resilience and Adaptation program because they recognize the need for their communities, many of which are smaller, to deal with the reality of a changing climate. And individual communities are pushing the climate resilience envelope to protect their people, property, and economies. Public officials in Yankeetown, FL are moving forward to protect the natural infrastructure that cushions their community from the impacts of rising sea levels due to climate change. These are just a few examples of leadership arriving in the form of local government – increasingly in unexpected places. That may seem obvious – after all, it is local government that has to deal with the impact of our failure to act aggressively enough to limit the extent of climate change. It is local infrastructure that is damaged, community residents that are put in harm’s way, and local economies that are left in tatters in the wake of the increasingly extreme floods, droughts, fires, heat waves, and storms that characterize our modern world. But there are other reasons why building climate resilience in America’s small towns and cities is so important. According to population estimates for 2017 by the U.S. Census Bureau, most Americans (83%) live in an incorporated area of less than 250,000 people. While many of these areas are what you and I would consider to be culturally “urban,” they do not have the resources of our major urban centers, such as New York, Los Angeles, and Chicago. Interestingly, small to mid-sized cities and towns are also where the bulk of America’s climate change denial lives. Urban areas increasingly are politically liberal while more rural areas tend to be more conservative. Unfortunately, whether one believes that climate change is real and that people are causing it tracks closely with political affiliation. Yale University’s Program on Climate Change Communication recently published its Politics and Global Warming Report: March 2018.The team’s research indicates that 95% of liberal Democrats and 88% of moderate/conservative Democrats believe that climate change is happening compared to 68% of liberal/moderate Republicans, but only 40% of conservative Republicans. When it comes to the question of whether people are causing the problem, those numbers drop, but the relationship still holds – 84% of liberal Democrats believe climate change is caused by human activities compared to only 26% of conservative Republicans. The takeaway? Democrats tend to think climate change is an important issue that demands action much more than Republicans do, and Democrats tend to be clustered in urban areas. Signatories to the “We Are Still In” campaign to signal the rest of the world that America’s state and local governments are still committed to the Paris Agreement, bear this out. Among the signers are Dallas, TX; Atlanta, GA; Charlotte, NC; Houston, TX; Little Rock, AR; Anchorage, AK; Salt Lake City, UT; and Phoenix, AZ. – all red states, but with major cities standing in opposition on the issue of climate change. The obstacles to strong national policy in the U.S. come from America’s conservative core, which is concentrated in smaller communities across the country. These communities can be hard to approach on the issue of climate change, especially if the conversation is around reducing greenhouse gas emissions that cause climate change because most Republicans do not think we are causing climate change. What they can talk about is climate resilience or adaptation – making changes to protect their community from increasingly severe natural disturbances and the chronic changes underway that are creating economic and social disruption. From that first step, it is often easier to take the second, which focuses on what is causing these dramatic local changes. While it is clearly important to protect people, property, and livelihoods in the near term, what is often missing from these conversations is a discussion about the long game of addressing climate change. Our global goal is to keep temperature rise below 1.5° Celsius and that requires massive, sustained investment over decades. The window of opportunity on the option of just focusing on reducing greenhouse gas emissions has closed. We live in a world where the climate is changing and will continue to change for the rest of our lives – and for the rest of our children’s lives. The work of transitioning to a carbon neutral global civilization requires that our next generation of leaders looks to, and invests in, the future. As human beings, we do this work of building for the future best when we are not under immediate or sustained stress. The more we face and rebuild from devastating storms, heat waves, sea level rise, and chronic impacts, the more we will be inclined to focus on the short-term goals of protecting our families and communities from the next natural disaster – or the influx of people fleeing that disaster. This is especially true if the strain caused by the impacts of climate change tears our social fabric, turning neighbor on neighbor and destroying trust in our communities. When decisions need to be made at that point about whether to protect the near or longer-term future, given finite resources we will likely choose the near term. It’s simply how we are wired. But if we choose that path, we will miss the one opportunity we have to address climate change to the point where we can still adapt to the changes that have already been set in motion. By working right now to build climate resilience across the U.S. in small and mid-sized cities, we will not only protect our families and communities in the near-term, we will protect our capacity to do the work of reducing greenhouse gas emissions over the long-term. We will reduce the likelihood of resource conflicts that can take our attention away from the need to address the root causes of climate change. We will build support for national climate change policy. And, we will protect the social fabric that is necessary for all communities to successfully navigate our now climate uncertain future. 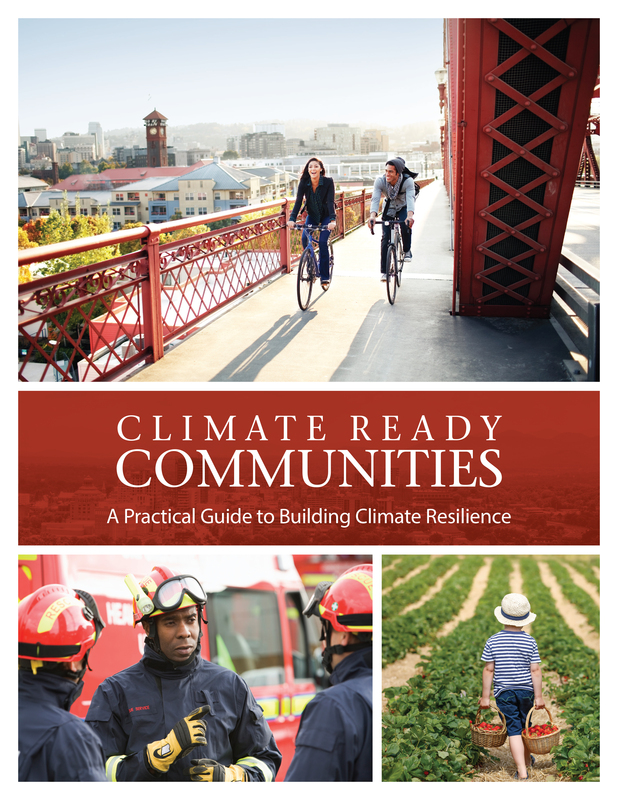 Local leaders in America’s smaller cities and towns who are stepping forward and taking action to build climate resilience, especially in difficult political climates, are our modern day superheroes. Given the profound lack of leadership being demonstrated at the federal level and in many state legislatures on climate change, our fate is in their hands.